Originality in videosystems has always developed with technological innovations in projection devices. Since the eighties, different artists started to experiment with the many opportunities that these devices offered them. Tony Oursler made some videosystems where he projected talking heads over some egg- shaped ovals, and Bill Viola and Steve McQueen created monumental screened presentations in huge walls. 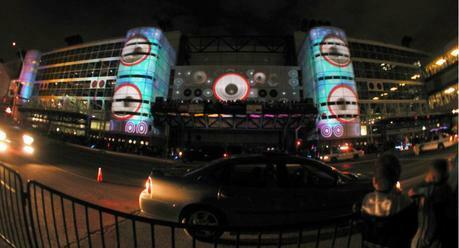 The latest years, the 3D technique development and the searching for stunning methods for the show business and publicity have given place to a new communication technique using screening, the 3D mapping projection. This technique is characterized for screening third dimension images over surfaces such as huge building facades, big installations or objects etc. Agencies like the TCH Access Agency offer the maximum creativity to acquire incredible volume and depth effects. From the success of the Samsung 3D projection on the historical building in Amsterdam, Beurs van Berlage, in May 2010, many brands like Mattel, Nike or Toyota have recourse to this technique. We present you one of the most successful projections that gave been lately created for the “Adidas is all in” campaign. This projection had place on the Palais du Pharo’s surface in Marseille, a big scale project orchestrated by DJ Cut Killer. This technique has also been used for fashion brands such as Ralph Lauren and, recently, we could see a good example during the new Santa Eulàlia store opening, a classic in the fashion business in Barcelona, placed in Paseo de Gracia.